An umbilical hernia is the most common type of hernia found in the dogs. This is a condition where there is a small opening in the abdomen wall area of the umbilicus allowing the possibility of contents from the abdomen to protrude. This area can be found on the dog’s stomach at the location where the umbilical cord was attached. It appears as a little soft lump or swelling. At birth, the umbilical cord is either chewed off by the mother dog or clamped and cut by the breeder or in the case of a C-section, the veterinarian. The normal umbilicus stays open in the fetus allowing blood flow and nutrients from the mother to the baby until birth when it normally would close. The body wall seals over after birth, but in the case of an umbilical hernia, a small opening remains and sometimes a small amount of fat escapes through the body wall and remains outside the body. If the opening is very large, there is a risk of a loop of intestine escaping and become strangulated. A strangulated hernia occurs when the contents caught in the hernia cannot receive adequate supply. This is a serious condition that requires surgery. Large hernias can pose a threat to the puppy. When the hernia’s contents can be pressed back into normal position it is called a reducible hernia. There is some debate as to the exact cause, but it is thought that most are likely inherited; at least it is thought that 90% of umbilical hernias are genetic in origin. These types of hernias are more common in certain breeds including Shih Tzu, Airedales, Pekingese, and Basenji although they can occur in any breed. Another possible explanation as to the cause is trauma that occurs at birth, either the mother dog tugs too hard on the umbilicus or the breeder is rough with tying off the placenta. Many experts argue that dogs with hernias should not be bred, however there are many litters born to hernia free parents that will contain a puppy that has a hernia. 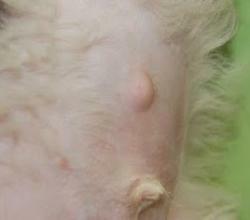 Umbilical hernias are visible bulges or lumps on the puppy’s abdomen. The veterinarian will try to push the contents from the hernia back into the stomach area and this allows them to determine the size of the opening. The size is most important because it decides the severity of the problem. A medium size hernia is most dangerous because it has the risk of allowing a loop of intestines to drop out of the abdomen and into the hernia, becoming trapped and causing he life threatening strangulation. Hernias that are smaller which means they are too small for a loop of intestine to enter, or very larger, where the intestines can freely come and go, are at lower risk for potential strangulation. Veterinarians may also use x-rays or ultrasound to help with diagnosis. Small hernias are generally not a problem and the dog can live out its entire life with no complications or problems. These small hernias sometimes close by themselves as the young pet grows. In the highly unlikely event that a hernia becomes painful to the touch, swollen or red, the dog should be examined by a veterinarian within 24 hours. Larger hernias can be repaired when the puppy is spayed or neutered since the dog is already anesthetized. The surgery consists of manually reducing the contents of the hernia into the abdomen followed by the vet making an incision over the sac. The tissue around the hernia is removed and the abdominal wall is closed. This is a routine type surgery. The location of the surgery for an umbilical hernia is very close to the location in which an incision is made in the body wall for a "spay" procedure in a female dog. For this reason, umbilical hernias regardless of their size are likely to be repaired at the same time as the female dog is spayed. At this time, the American Kennel Club allows dogs to be shown who have had a hernia repaired. Breeders and veterinarians again argue back and forth about the dangers of breeding a female dog who has a hernia or who has had one repaired. The argument is that the increased weight pressing down on the area from the pregnant uterus could cause the hernia opening to stretch and enlarge. There is also debate about whether the female will pass on the tendency to produce umbilical hernias in her offspring. In my experience, we have never had a problem. Our females who do not have hernias may occasionally produce a pup with a hernia and likewise, a female with a hernia may produce an entire litter of puppies that do not have hernias. This suggests that the presence of hernias may depend on multiple genes, and not a simple one-gene dominant/recessive relationship. Of course, the ethical breeder will call the presence of the hernia to the attention of the prospective new owner, but because the condition is so common in many breeds, it should not be a cause for immediate concern.